Our systems are widespread around the world in the automotive industry. Most leading manufactures use them for emission measurements according to latest standards like WLTP. Besides they are used in environmental simulation chambers, where the effects of moisture, salt spray mists, sand, UV radiation or extreme temperatures on varnish and plastic parts are tested. 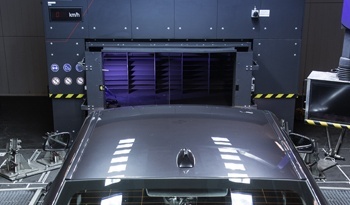 Other areas of use include aerodynamic and acoustic measurements at vehicle parts such as door seals, outer mirrors, decorative strips or spoilers. Realistic simulation of the air flow as well as the heat and material transport processes is also decisive when developing sports items, clothing, outdoor equipment or building facades for which we create customized solutions. 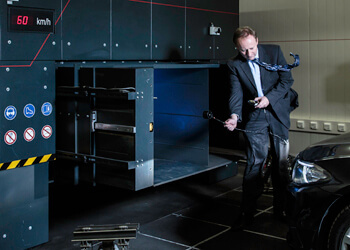 Our wind simulation systems meet high requirements to give you accurate and reliably reproducible measuring results at all times: The air flow is consistent across a large area and has neither turbulences nor fluctuations in terms of speed or density. With the help of CFD-simulation and based on decades of experience, our engineers will design whatever is physically feasible for you as well. LTG Fahrtwind-Simulators were designed especially for use in the automotive industry. Their special advantage is the proven tangential fan technology. 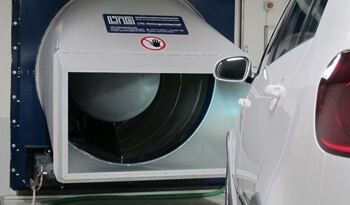 LTG wind tunnel solutions are based on axial fans. 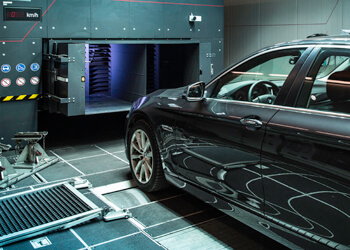 Wind tunnels are particularly useful for acoustic vehicle analyses, tightness tests and quality tests thanks to their uniform air conditions, flexibility and low costs.